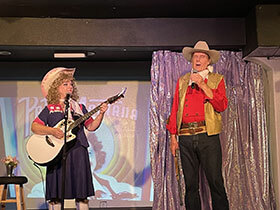 “All Crazy ‘bout Patsy” is a 90 minute show with no intermission dedicated to the music of Patsy Cline and other country legends. Over 15 of Patsy’s hits are featured in this production by Alice Fay, a long time Branson performer. And introducing a new young talent in Sierra Schwanz with fiddle music provided by Jerry Shapiro. This is a great show for those looking for a show with mostly all good country music.